If you use row planting in your raised garden, you’re missing out! You could be growing a lot more, without any extra effort. Do not worry though, ambitious gardener. There’s a better way and we’re here to show you the plant spacing ‘light’. Below we’ll give you a quick tutorial on plant spacing needs for different vegetables. We’ll explain how plant spacing works best when growing in a raised garden, how you can effortlessly partition your garden into equal growing sections, and even give you a plant spacing chart you can share with friends, put on your own website, or just use for yourself so you can grow a garden so great, the Jones’s will have to keep up with you! Already understand plant spacing and just want to reference our spacing chart? Scroll to the bottom of this page. Need a planting spacing grid? 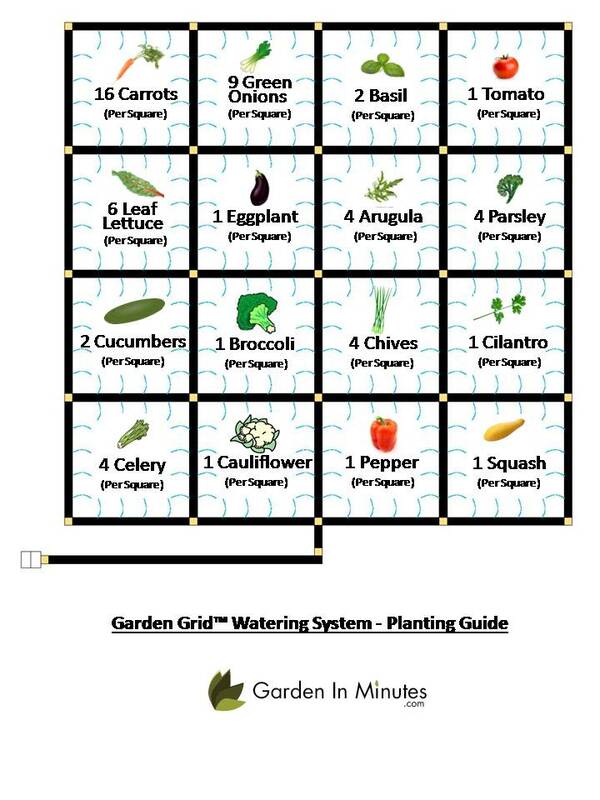 View our Garden Grid™ watering system here. Here’s what you should be doing: Plant by area, not by rows. Row spacing is meant to giving you a walking path between plants, you shouldn’t be walking in a Raised Garden. When you grow a garden in a raised garden bed, the purpose of the bed is to condense your growing area to a point that you can reach all plants, without having to step into the growing area. That’s why great raised gardens always have one dimension of 4ft or less. (i.e. 4×8 raised garden , 3×6 raised garden). The reason for this dimension is that an average person’s arm can reach at least 2ft. So when you see a gardener with a raised bed that’s 4ft wide, you’ll know that savvy grower can always reach the middle of their growing area! Since you don’t need to walk in your garden, your soil never gets compressed, your plants don’t get squished, and your favorite pair of sneakers stay nice and clean. It’s a win, win … win! So what do we mean ‘plant by area’? Planting by area means taking a square section of garden, and dividing the length and width of that section by the plant spacing needs. Now, we normally do not condone being wasteful, but we want you to take that row spacing number, and throw it away! You won’t need it. What you will need is the seed spacing/plant spacing number. You will use the seed spacing/plant spacing number to divide up planting sections to know how many seeds to sow. Typically about 1 square foot sections are preferred. We say “about 1 square foot” because the thickness of a garden bed board will make the growing area of your garden just under an increment of 1 foot; but not to worry, your plants will never know the difference. To make plant spacing easier, many gardeners will make a plant spacing grid. 1st they’ll measure their garden bed. Then go out and buy materials such as wood or string and screws. Then cut everything to length. Then attach the pieces to the frame of their garden bed to make a grid. If you don’t want to go through all of that hassle, we were nice enough to create a pre-assembled, tool-free plant spacing guide for you, and it just so happens to also be a garden irrigation system. It’s called The Garden Grid. We have our simple plant spacing chart below if you want to jump ahead and begin planting now, but if you want to know how we got the plant spacing measurements, stick right here! We’re going to do a little math. Don’t panic! We promise it’s really, really easy. Step 2: Divide the width of your planting section (about 12 inches) by the 3 inch seed spacing. Step 3: Repeat step two but for the length of your planting section. (Also about 12 inches). Answer: 4 plants across X 4 plants across = 16 plants! Step 5: Start planting! With 3 inch seed/plant spacing needs, you can grow 16 plants in a 1 square foot area. Step 6: Keep planting! You now have the plant spacing formula for the rest of your garden! For a little planting inspiration, try out this sample plant spacing layout we made for our 4×4 Garden Grid watering system. We also have salsa garden and salad garden planting layouts! Now… what you have all been waiting for! Find what you can grow the most of or find your favorite plants, but most importantly – get out and start growing! So there you have it! Our all-in-one, everything your need to know, plant spacing chart and planting guide. Planting by area was inspired and made popular by the concept of square foot gardening, if you want to learn more about square foot gardening, check out our other article on just that! Also, if you’re still curious about setting up a planting guide with an integrated irrigation system, where you won’t need any tools, check out The Garden Grid on our How it Works page! Our plant spacing chart is always growing. Have something you want added? Let us know in the comments below!